A year into the venture she bought out her partner and fell into the orbit of the Women’s Business Center at the Salt Lake Area Chamber of Commerce. That turned out to be a smart move, she says. The Center’s mission is to help women like Kirschbaum–entrepreneurs who can be encouraged, mentored, and taught the nuances and basics of business. So Kirschbaum learned about such things as cash flows, marketing, and everything about operating her own Internet web site (“That’s worked out very well,” she says). She joined the Chamber and got involved in the Women’s Business Forum, where she worked on its steering committee. She completed the Chamber’s intensive ten-month Leadership Utah course and was honored as a Chamber Champion for making a significant commitment of her time, talent, and resources to the chamber and its many programs. Ask her about the Women’s Business Center. “They want to see you succeed. They’ll do anything they can to help you succeed,” she replies. For women in general, that represents quite a bit of progress in about a generation. As society changed, so too did the Chamber. When Fred Ball became executive vice president of the Chamber in 1971, no woman had ever held a management position in the Chamber, he said. In 1973 he organized The Women’s Council. “There were just eight of us sitting around a table,” he recalls. Those first members included Doris Taggart of Zions Bank, who was its first chairperson; Patricia Shoemaker of KSL Radio, Phyllis Stoerts of the Hotel Utah, Mildred Jensen of Mountain Fuel Supply, and Lela Ence of the University of Utah Alumni Association. “Eventually all of the original members served terms on the Chamber’s board of governors,” he says. The organization grew rapidly and soon became the largest council in the Chamber with more than two hundred members. 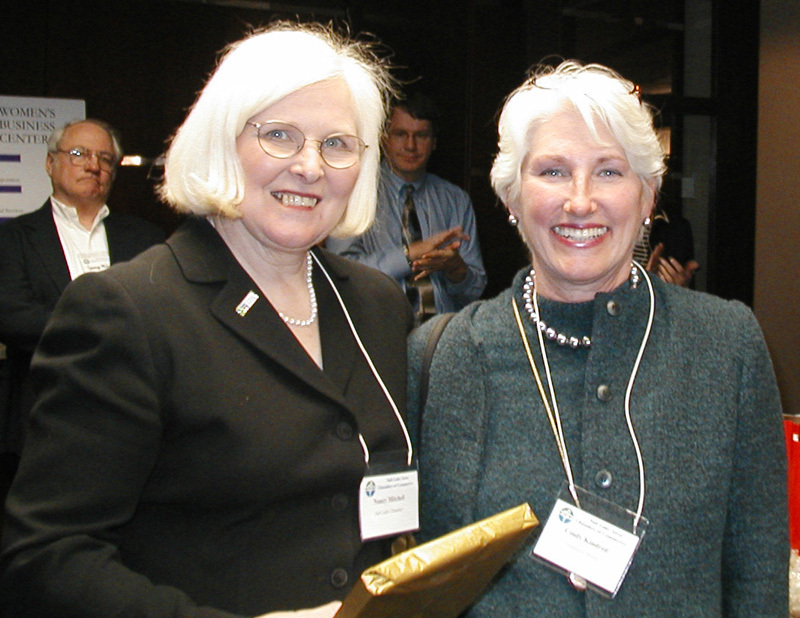 Lee Ence became the first woman to sit on both the board and the executive committee, and in 2000 Patricia Richards of First Security Corporation became the first woman to chair the Board of Governors. In 1976, Deborah Bayle joined the Chamber as a secretary in the research department and rose rapidly in responsibilities. Eventually she became the Chamber’s chief operating officer and its vice president for administrative services. In 1976, the Chamber launched the Women and Business Conference. 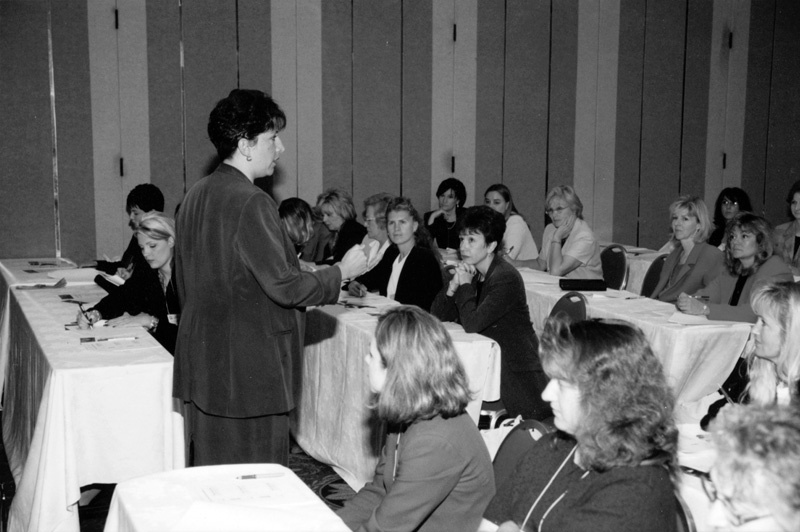 Linda Galindo gives a presentation on Health Care Dynamics in October 1999 at the Women’s Business Conference. All of that led up to 1997, when Stan Parrish, president of the Chamber, applied for a matching grant from the Small Business Administration to fund a Women’s Business Center to be housed at the Chamber. Ramona Rudert, vice president of operations, wrote the grant proposal, “not knowing I’d be working in this program.” She ended up as its first director when the grant was awarded, and the Women’s Business Center moved from its former home with the Utah Technology Finance Center to the Chamber’s offices. At the time the Center opened, Sherrye Henry, an assistant administrator in the SBA, came to do the honors and said that about 38 percent of all Utah businesses were owned by women. She said that many women didn’t have business experience, “but they have a dream and a dedication, and the center can help them succeed.” Besides helping women start a business, there was also a goal to help some women get off from welfare, she said. Founding partners in the Women’s Business Center were Bank One, American Express, and the Utah Technology Finance Corp. Sponsors were First Security Bank, American Investment Financial, Scopes Garcia Carlisle, Art House Graphic Studio, and Vee Carlisle. Five years later, many of the same organizations were still involved. The Center’s original goals were to provide counseling, training, loan-packaging, marketing, management, and finance and procurement assistance. In 2002 those hadn’t changed, although it also emphasized networking and mentoring opportunities. One of the Center’s more valuable contributions is the opportunity for small business owners like Kirschbaum to meet with successful businesswomen who can help and support them. Two years after its founding, Rudert left, saying the lure of entrepreneurship was just too strong for her. Nancy Mitchell, the assistant director, succeeded her. Mitchell herself won accolades as a businesswoman, receiving the Women in Business Advocate of the Year award from the SBA and serving as president of the National Association of Women Business Owners. In 2002, that organization’s Center for Women’s Business Research said the Salt Lake City-Ogden metropolitan area ranked first among the country’s fifty largest cities in the rate of growth of women-owned business, calling the area a “hotbed for women’s entrepreneurship.” And members of the organization said one reason for the area’s growth was that it had a rich history of women running their own enterprises. Figures showed that the number of employees at women-owned businesses grew by 94 percent over five years while the nation was averaging 30 percent. It was a strong affirmation of the need for the Chamber to be involved in their success. Sources: Fred Ball manuscript at Salt Lake Chamber offices, 175 East 400 South, Salt Lake City. Interview with Deborah Bayle Nielsen, 10 June 2002, and with Marcella Kirschbaum, 21 June 2002. Mission statement from Women’s Business Center, Salt Lake Chamber offices. Deseret News, 28 February 1990, 6 October 1997, 25 November 1997, and 30 July 1999. Salt Lake Tribune, 23 June, 2002.